Problem statement: Given an 8:1 multiplexer such that the input connected to 5th input is the most setup timing critical and other inputs are timing critical in the order D0 > D1 > D2 > D3 > D4 > D6 > D7. Restructure the logic accordingly. Solution: We know that the most setup timing critical signal should have least logic in the data path. So, we need to prioritize 5th input such that it has least logic out of all the inputs. In other words, this is a problem of converting an ordinary multiplexer to a priority multiplexer. Let us first discuss how we can convert a multiplexer to priority mux. Figure 1 below shows a multiplexer with 8-inputs D0 - D7 and selects S2,S1,S0. This multiplexer can be represented in the form of a priority multiplexer as required is as shown in figure 2 below. We can start from the equation of the priority multiplexer and prove that it is actually equivalent to 8:1 mux. Simplifying the above equation leads us to the equation of ordinary multiplexer. In the above diagram, X0 has the highest priority; followed by X1, X2 and X3. A priority multiplexer selects the input if the corresponding select line is "1" and none of the select lines with with higher priority is "1". For example, if S0 is "1", X0 will be selected always. 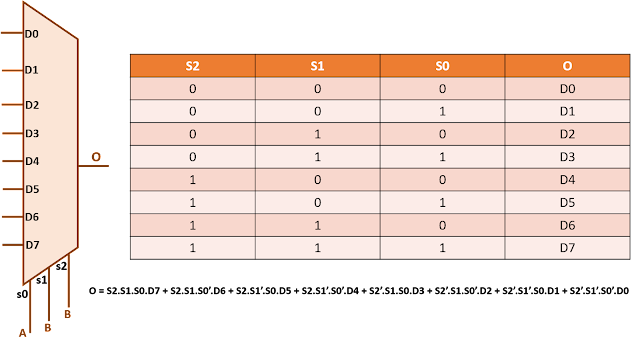 But if S2 is "1", X2 will be selected only if both S1 and S0 are "0". The output of the priority mux is not valid if all the select signals are "0", as we dont know which input to select in that case. That is why, figure 1 shows the D0 of the left multixer as don't care. How a priority mux differs from a normal mux: In a normal mux, all the inputs have equal priorities, whereas they have different priorities in case of a priority mux.